Dragons claimed their first win of their Challenge Cup campaign against Pool 1 bottom side Enisei-STM. 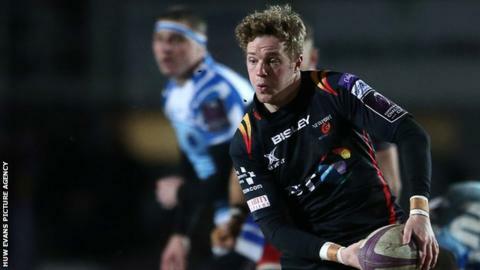 Dragons captain Cory Hill scored the opening try at Moscow's Slava Stadium and wing Jared Rosser added a second before half-time. Hallam Amos claimed Dragons' third, but the Russians hit back through Stanislav Selskii and a penalty try. Charlie Davies' try sealed a bonus point for Dragons, who had to hold on when Enisei's Anton Rudoi struck late. Enisei-STM: Gaisin; Baranovs, Kacharava, Gerasimov, Kurashov; Kushnarev, Shcherban; Polivalov, Selskii, Zykov, Saulite, Krasylnyk, Gachechiladze, Gargalic, Rudoi. Replacements: Gasanov, Morozov, Podrezov, Elgin, Budychenko, Uzunov, Trishin, Orlov. Dragons: Amos; Rosser, Morgan, Howard, Gasson; O'Brien, Pretorius; Garrett, Dee, Brown, Davies, Hill (capt), Wainwright, Griffiths, Benjamin. Replacements: Ellis, Davies, Fairbrother, Landman, Thomas, Davies, Henson, Warren.